Celebrate the launch of the NACTO Transit Street Design Guide at the New York Transit Museum in Downtown Brooklyn. Join contributors from the MTA, the NYC Department of Transportation, TransitCenter, and NACTO for a conversation about the much-needed link between transit planning, transportation engineering, and street design. 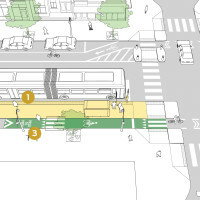 => Celebrate the launch of the NACTO Transit Street Design Guide at the New York Transit Museum in Downtown Brooklyn.